Originally published in Renovate! Reuse! Recycle! An aerial view, looking northward, of Rotations: Moore Estates, a mock-up of just one of the many residential developments that are supplanting the area’s farmland. In the distance, the real thing looms large. Moore walks along the wheat roads of Rotations: Moore Estates in July, 2006, when the crop was near full maturity. GPS and CAD renderings helped Moore better visualize his work, making the plotting process easier by allowing Moore to decide scale and orientation early on in the process. An aerial view, looking southward, of Rotations: Moore Estates. 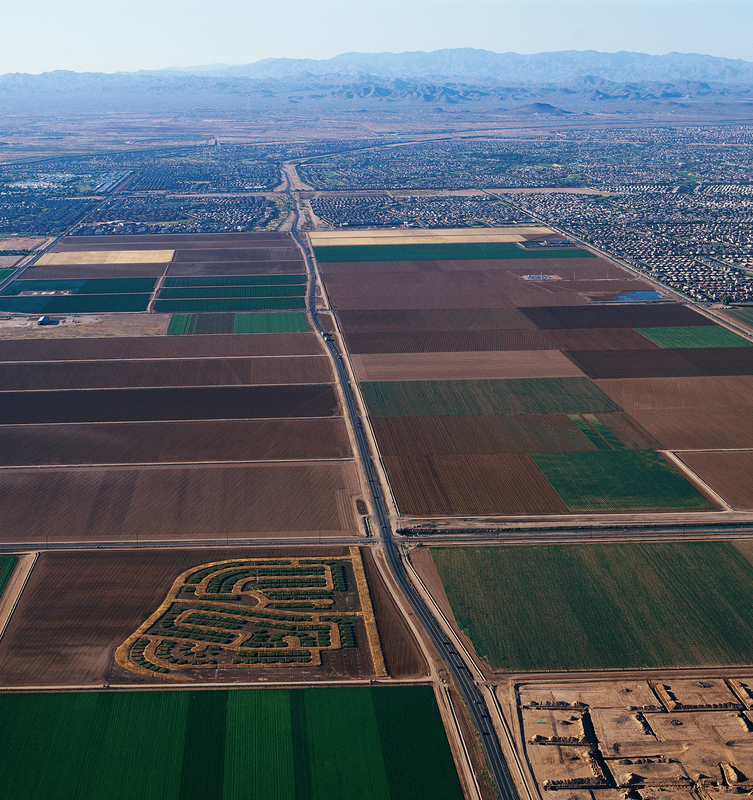 Countless housing developments crowd the periphery of the area’s remaining farmland. The developments are broken up into self-contained units. Typical to sprawl, the work and service sectors are accessible only via highway. When Goethe said that sowing is not as difficult as reaping, he was getting at a truth more universal than agrarian, though any farmer will tell you that in either case, he’s right. For centuries agriculture was the hub of civilization, and farmers the shepherds of society. But industrialization, globalization, and technology have changed this. Urban centers are expanding outward, and food supplies have become consolidated and disembodied through outsourcing. Our seeds are now 3,000-square-foot single-family homes, neatly planted to accommodate the influx of new hires at an information technology company 60 miles down the road; the soil comes in the form of a big box store, where we can purchase everything and anything (all at once, regardless of season); and we can only hope that the climate for home buyers, information-based economies, and commuters remains clement. Moore began working on art pieces that would become sketches for Rotations: Moore Estates, his current, larger-scale work. At that time, Moore’s family was still optimistic about the longevity of the farm, but they were hemmed in by a number of landowners who were selling to big developers. “We knew that if we didn’t do anything, we’d end up being [zoned an] all-water reclamation area, and the land value would be horrible.” With the inevitability of sale impending, Moore set about his first large-scale land art piece, renting a 30-acre parcel of land from a neighboring farmer and planting drought-tolerant barley out of which he cut a generic floor plan, entitled Rotations: Single Family Residence. The process made Moore think a lot about his own imprint on the land. “You can’t really point fingers at the subdivision, unless you look at yourself,” says Moore. “Farmers brought water here with canals, and it’s beautiful growing ground—but in terms of sustainability its questionable, especially when you start plopping down 3,000-square-foot homes, within 12 feet of each other.” He has a point: While agriculture has long been the scapegoat for Arizona’s water woes (the state uses 2.4 trillion gallons per year: an amount that could support a residential population of nearly 30 million people, as opposed to Arizona’s 5.7 million), it’s agriculture’s technological efficiency that has largely saved the region from becoming like Southern California or Nevada. In truth, the Salt River Project now delivers just 13 percent of its water to agriculture, compared with delivering about 50 percent of its water to agriculture in 1984. Yet water consumption has not gone down, suggesting that residential developments are using just as much water as conventional agriculture, which has cut its share of water consumption by 20 percent in the past thirty years. The bottom line being that, in terms of sustainability, something has to change. Initiating dialogue is second nature to a farmer, who, by trade, has learned to work with many elements for a mutually beneficial result. Moore, being both an artist and a farmer, seems especially equipped to initiate synoikismos. [Rotations: Moore Estates] exists as a link between the past and the future,” says Moore. “It comes down to stewardship, which is really important in agriculture, but which we don’t really have a sense of anymore. There’s no sense of history in Phoenix that there was desert or agriculture before, unless it’s in the name of a subdivision, like ‘Cotton Field Acres’ or something like that.” In many ways, Moore’s work is a manifestation of this call for stewardship both environmental and social—the suggestion that the past is not something to simply do away with, but rather something to consider, regenerate, and reshape. “There’s a lot of pain in this history, but there’s a lot that’s wonderful about it, too; instead of being angry, the best thing to do is to learn. If [this work] inspires somebody to do something differently, then hopefully it will make a difference in a smaller community and grow out from there,” explains Moore, who along with Carrie has decided to stick it out for the next few years in Arizona, working both in conventional agriculture and starting a new, organic venture. As Ingersoll posits, “When the day arrives that sprawl begins to make sense, can we anticipate an unleashing of aesthetic and civic resonance?” It seems, for some, these seeds are being sown.